Ready! Set! Go! It's time to engage your culture! FOX News & Commentary host, Todd Starnes, talks about some of the most crucial religious liberty issues facing us today and offers some sound advice for Christians as they live their faith in the marketplace. Bob: Fox News contributor, Todd Starnes, believes that religious liberties in the United States are eroding; but he says as we stand for our freedom, we must stand with truth and grace. Todd: Just a few weeks ago, I was a guest on a Christian program. The host started speaking disparagingly about a very well-known atheist and suggested that this atheist should befall some violence. I immediately ended the interview and told the host that we don’t do that, as Christians. We must stand firm in the faith, but we must do so with grace and love—not harm. Bob: This is FamilyLife Today for Thursday, June 12th. Our host is the President of FamilyLife®, Dennis Rainey, and I’m Bob Lepine. It’s not surprising that our worldview would clash with the culture. The question is: “How do we represent Jesus best as we interact with those with whom we disagree?” We’ll talk about that today. —we better get our armor on and know how to do it because, if it hadn’t already come to your neighborhood, it will soon. We have with us a warrior, certainly, on Fox News. 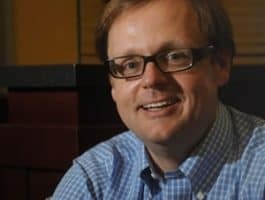 Todd Starnes joins us on FamilyLife Today. Todd, welcome to the broadcast. Todd: Thank you very much for having me. Appreciate it. Bob: No, the “B” is kind of shaded out here. Dennis: It is kind of shaded out, and it’s God Less America. And it’s: Real Stories From the Front Lines of the Attack on Traditional Values. You had a conversation, the other day, Todd—that kind of typifies what this book is about. You talked to Rick Warren. He made an interesting observation about what Bob mentioned earlier. Todd: That’s right. Pastor Warren was walking the hallways, over at the Fox News corner of the world—there in Midtown Manhattan. He told me that he believes that this issue of religious liberty is going to be the civil rights issue of our generation. And I believe—at least in the stories that I’ve covered, over the past five years or so, in the culture war—I believe that he is absolutely right. I believe that we are on an expedited route to that being the issue of our generation. Bob: You know, you just used a phrase that a lot of younger listeners heard you use. They heard you say, “Culture war.” They just rolled their eyes; and they said: “Oh, here we go again. I’m so sick of hearing about the culture war. Can we just drop that?” You’ve heard that from younger people; haven’t you? —when churches were so consumed with those issues that they really didn’t do anything else. I think, as a result of that—many churches have just totally shied away. In the process of doing so, I believe that they have actually removed themselves from the culture. I have a line in the book that, in this day and age, churches are so concerned about being culturally relevant that they’ve become spiritually irrelevant. Dennis: Yes, the Sermon on the Mount—back to what Bob quoted earlier—Jesus goes on to say that we’re called to be salt and light. A light’s got to shine, and salt has got to be pressed into the culture. Bob: But we’ve got to acknowledge that a lot of churches—a lot of Christians—have not been very effective. They’ve not represented Jesus well trying to be salt and light. Dennis: Yes, that’s right; but they haven’t modeled Christ. You know, when John described how Jesus came,”…and we beheld His glory full of grace and truth,”—and it was with forgiveness and compassion as well as the standard. Christ was the standard bearer, but He was also—He also had a great heart for people. Somehow, in the midst of the culture wars—that you referred to earlier—in the 70s and 80s—I think we were known too much for the standard side and the truth side and not enough for the grace, and forgiveness, and compassion side. Todd: Oh my goodness. It looked like a Wednesday night church business meeting a lot of times. [Laughter] There was a lot of hollering and shouting—just a lot of mean folks! Todd: Well, you’re absolutely right. You know, just a few weeks ago, I was a guest on a Christian program. The host started speaking disparagingly about a very well-known atheist and suggested that this atheist should befall some violence. I immediately ended the interview and told the host that we don’t do that, as Christians. We must stand firm in the faith; but we must do so with grace and love—not harm. Dennis: You know, Bob grew up in Saint Louis. I grew up in a small town in Southwest Missouri. I didn’t have a complete Leave It to Beaver childhood back in the 50s, 60s, and 70s, where I grew up; but it was a community that supported what you’d call traditional values. Bob had the same thing in Saint Louis. Dennis: You grew up in northern Mississippi—smaller town there. Same thing for you; I assume? Todd: It was. And again, it wasn’t a Mayberry-type of growing up time for me; but there was a sense of community and a sense of shared values. It didn’t matter if you were a Baptist, or a Methodist, or a Catholic. We sort of had this idea that we were one nation under God, and we had certain shared values within that community. Dennis: So, what happened, Todd? I mean, where did we take the turn toward the wrong side of the tracks—where America got off and left God and decided it wanted to be its own god? Dennis: I’m trying to picture that for just a second. Todd: It’s a frightening concept. But we do live in this society now, where what was right is now wrong / what is wrong is right. It seems as though the world is topsy-turvy. You know, we—I suspect—and I think a lot of folks will agree with this—that, unfortunately, we put our trust in political parties rather than the Lord. And one of the things that I’ve discovered in my research into this issue is that—dating back to the Eisenhower years, when the Supreme Court really started addressing these big culture war decisions like prayer in school, for example—every single one of those decisions—most recently, the Defense of Marriage Act—every decision was made by Justices appointed by Republican presidents—not Democrat presidents—but Republican presidents. Todd: And for me, that was an eye-opener because, if you believe what’s being said out there, one political party stands for family values and American traditional values and the other does not. That’s not necessarily the case. Dennis: Well, it used to be. Bob: Do you think we’ll live to see that day? Just recently, that came out—that revelation that he gave that donation, as a private citizen, came out. Now, there are protests and boycotts directed at his company, demanding that he be fired because he supported traditional marriage. If that happens, at that level, you better believe that something like that’s going to happen at the church level. And here is the reason why—we are seeing private companies and businesses facing lawsuits—facing persecution for refusing to give in to their religious beliefs, specifically on the issue of gay marriage. There is going to come a time when someone finally says: “Well, wait a second. Where are people getting all of this information about this belief system about marriage?” Well, that’s—they are going to look at the Bible. When they look at the Bible, I believe that they’re going to have to start putting limitations—they’re going to have to start curtailing religious freedom—all for the sake of tolerance and diversity here in the United States. Bob: But we’ve got this First Amendment that is supposed to protect us from that. Todd: But the courts are saying over and over again—and these are lower courts and these battles are going to end up at the Supreme Court—but right now, the courts are telling us that gay rights trump religious rights. Bob: Just let that hang in the air for a second. You’re saying that the First Amendment is trumped by the rights of homosexuals. Todd: That’s correct. In a case in New Mexico, where a Christian photographer and her husband faced discrimination charges, the court, in essence, said that you have to be willing to give up some of your First Amendment rights so that you don’t discriminate against another people group. Dennis: That really was what Chuck Colson saw coming a few years back when he crafted the Manhattan Declaration and took on three issues. He took on, obviously, the value of life; secondly, our religious freedoms; and third, the sanctity of marriage. One of the stories that really hits home for me—a family out in Oregon—the Cline family. They run a bakery—a mom-and-pop bakery—called Sweet Cakes by Melissa. They have three children. A gay couple came in and asked for them to make a wedding cake. They declined to do so. This family found themselves under an investigation by government officials. They found themselves facing protests and boycotts by gay rights activists. Their children received death threats—death threats—all because this family would not make that wedding cake. They said, “We’ll make anything else in the store for you—brownies, a sheet cake—but we cannot make a wedding cake.” That was not good enough. As a result of that, the couple had to shut down their retail store. Now, they operate their business out of their home. Todd: And there are those who say that those of us who support traditional marriage are bigots / racists. Jim Crow racist, I believe, is a phrase that’s been used. And this is why this is very disturbing because, once an argument reaches that level—where you are labeled a racist—you can’t debate that. You cannot win that argument. So, in essence, the argument has already been lost. That’s why I believe Christians need to start taking a stand—doing so in a spirit of love—but they need to take a stand. Bob: So, when Kirsten says, “Just make the cake! “That’s how you love these folks—is you make a cake for them—a wedding cake.” What do you say to her? Bob: There are pastors who are doing that as well. Dennis: Yes—and just—I don’t operate in your world, which is a good bit of a sound-bite world. I mean, answers come in 45-second to 90-second chunks. If it has to be reasoned, from a worldview perspective, there is simply not time to sit down on the news and reason with people from the Bible about why you believe what you believe. What are followers of Christ to do as they operate in the marketplace?—because their careers, their businesses, and in some ways, their families and their children are going to be pressed into this battle. They’re going to have to know how to stand—any advice for them about how to do it? Todd: Yes, they need to be prepared to suffer the consequences for their faith. I tell a story in the book about Sergeant Phillip Monk. He is in the Air Force, lives in San Antonio, and works at Lackland Air Force Base—a wife and three sons. He was working with his commander—a new commander—and she is a lesbian. One of the underlings said something that the commander felt was offensive to gays. She was discussing with Sergeant Monk the punishment. He suggested that this deserved a good talking to—and in Air Force language—that meant he was going to be read the Riot Act. But the commander wanted a much harsher punishment that would have really penalized this underling. Because the sergeant disagreed, the commander stopped the conversation. She looked directly at Sergeant Monk; and she said, “Where do you stand on the issue of gay marriage?” He refused to answer that question. And his silence—she took his silence to mean that he was opposed to gay marriage. Sergeant Monk, who was a Southern Baptist—a member of the local Baptist congregation—found himself relieved of his duties as a result of that situation. I believe we are going to see a lot more Sergeant Monks out there, just like the Chief Executive of Mozilla, just like the head of the Sacramento or the California Theater Company, who supported Prop 8 and found himself out of a job, just like an educator in Baltimore who signed a petition—signed a petition to support traditional marriage. As a result, was relieved of her duties, moving forward. Dennis: You don’t know this; but last summer, when the Supreme Court ruling came out for DOMA, I wrote an email to our constituent base, here at FamilyLife. I didn’t have any hate speech. There was no targeting any group. It was just a statement that I made that I stand for biblical marriage, and I was grieved by the Supreme Court’s decision. I was saddened by it and what it will mean for our country. As a result, I received over 300 emails—that in various ways, not only asked to be removed from our mailing list, but also referring to me as the kind of example of Christianity that they wanted to have nothing to do with. I want you to know that I’d intentionally been compassionate, loving, filled with grace—not pointing out anybody’s sin or throwing a stone at any group of people. I was just attempting to stand for—and I did, and I still am—for marriage as God designed it. I think more of that kind of thing is going to come at us from various circles. Todd: And I believe you are absolutely right, Dennis. Last year, I received an email from a Christian serving in the military. It said, “Mr. Starnes, you are not going to believe what they are trying to teach us.” Military personnel have to go through equal opportunity training—you know—the tolerance and diversity training. In the course of this training, the instructor put up a series of slides. On the slides, they identified domestic hate groups and examples of religious extremism. Now, according to the military—and they sent us a photograph of the slide. We tell this story, and it’s just mind boggling—but according to the military, examples of religious extremism include evangelical Christianity and Catholicism. Then, they listed several well-known evangelical Christian ministries out there—the Family Research Council, the American Family Association—as examples of domestic hate groups. Bob: They’d gotten this from the Southern Poverty Law—what is it? Todd: The Southern Poverty Law Center. Well, I believe that, if we continue down this trajectory, that we are going to see pastors arrested. We are going to see sermons shut down—people accused of hate speech. And what better way to shut down those churches and to padlock those churches than to teach our soldiers—these 17-, 18-, 19-year-old kids—that what’s happening in those churches is an example of religious extremism? Dennis: Well, I want to take it back to how Bob began the broadcast when he quoted the conclusion to, at least, the beginning of the Sermon on the Mount. I think the message of today’s broadcast is, regardless of where you are in life, you better determine what you believe and you better come back to the cross of Jesus Christ because that’s where death was defeated. That’s where God showed up; and He made the statement about His love and His forgiveness. He calls us to be cross-bearers. I spent some time, this past weekend, on the phone with a spiritual mentor of mine, H.D. McCarty. I called him on the phone about another matter. All you’ve got to do is look—what did they do to Christ? Well, they crucified Him. I think, today, as never before, we need to be—we need to be standing firm, first of all, but then, we need to be passing this on to our kids. We can’t let them become indoctrinated or brain washed by an education system or an entertainment or media system that would take them off track to another worldview—away from the Bible—that doesn’t have convictions. I think it is game time. I think it is very, very important that we stand firm and strong on what the Bible teaches about, well, the major institutions God made. And one of them is marriage. We do have copies of Todd’s book in our FamilyLife Today Resource Center. It’s called God Less America. You can go to FamilyLifeToday.com to request a copy of the book. Again, the website is FamilyLifeToday.com to get a copy of the book, God Less America, by Todd Starnes. Or you can call 1-800-358-6329. That’s 1-800- “F” as in family, “L” as in life, and then, the word, “TODAY.” Ask about the book, God Less America, when you get in touch with us. You know, we had a lot of people who contacted us last week about the special offer on the Stepping Up® ten-week series for guys. Apparently, a lot of guys are going to be doing this, this summer, with a group of friends or with other dads and their sons going through the ten-part DVD series on Stepping Up. Part of the reason they contacted us is because, this month, our team has agreed that, if you’ll get the DVDs, we’ll send you manuals for the five guys who you have joining you. It’s our way of saying: “Let’s work together on making this happen this summer.” Get a group of guys together / go through Stepping Up. You buy the DVDs; we’ll send you manuals for the five guys you invite over. Get the details when you go to FamilyLifeToday.com and click the link that says, “Go Deeper.” All the information you need about the Stepping Up series is available right there as well. Now, tomorrow, we are going to talk more about the erosion of religious liberty—religious free speech—in our country. Todd Starnes will be our guest. Hope you can be back with us as well. Todd Starnes is the host of FOX News & Commentary — heard daily on hundreds of radio stations. Throughout his journalism career, Todd has covered a number of high profile stories — taking him from Wall Street to the White House.He is a regular contributor to FOX & Friends and FoxNews.com. He writes a weekly column for Human Events and TownHall.com.Todd is the author of two books. “Dispatches From Bitter America” is a collection of essays detailing how President Obama has declared war on the values that made this country great.“They Popped My Hood and Found Gravy on the Dipstick” was published in 2009 and became a best-seller. The book was a collection of humorous and inspirational stories from his open heart surgery in 2005.In his spare time, Todd is active in his church, plays golf, follows SEC football, and eats barbecue.